A cutesy, fun-loving and brightly coloured animation about an evil villain discovering his softer nature. What can be said about Despicable Me? I must admit I am grateful I knew next to nothing about what happens in it because honestly… not much! This is storytelling 101 stuff, and even giving you a simple synopsis will probably spoil it. Gru is an evil villain, in a world where super-villains are expected, and when he is superseded by a young villain who steals an entire pyramid, he vows to redeem himself as top villain! His plan: to steal the moon. Unfortunately things go wayward when he needs the help of three orphan girls to aid him. Keeping his evil secret (and evil nature) might be difficult! The film is very, very cute to look at. The colours and designs pop and shine with vivid colours and the action and slapstick comedy are powered by a child’s sugar rush, yet it doesn’t go so far as to be obnoxious or unpleasant. 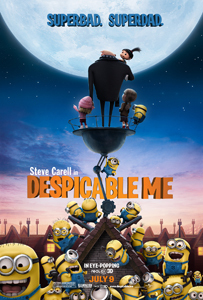 In fact the film’s first half is surprisingly mellow at times; the camera slowly follows our brooding, dare I say despicable, villain (voiced well by Steve Carell) and the visual gags are given time and pacing for full effect. There’s a sense of shot composition too, which is nice. But… the story is mind-numbingly simple. In the first ten minutes the two worlds of super-villain and innocent children looking for parents scream the blatantly obvious pay off. I continued to watch of course, the film’s bouncy energy holding my attention (and attention of all children, no doubt!) but nothing else really happened. It is a basic premise, it could even have been a short film! Briefly in the middle I found myself wondering… “I know what you are doing, get on with it” when we are given various superfluous distractions. This reminded me of Cloudy with a Chance of Meatballs, a good fun time with lots of colour and vibrant life. It is always nice to see original concepts getting big screen attention, perhaps the sequel this year can improve on the story-telling. Additional Marshmallows: And yes, the minions are awesome. I especially liked the one that was hit by the shrinking ray and squeaked when squeezed! Maybe a little too much “oh look, we can do 3D now!” effects and an awful pop song, over the end credits.